Bodies aren’t static, they don’t have straight lines, and after a while they tend to get dirty. So wearable systems embedded in garments and accessories have to be robust, flexible, and, ideally, washable (or at least removable). Here’s a look under the hood — or hoodie, as it were — at the main components of wearable devices. Wearable-specific microcontrollers are small, so as to be comfortable and discrete. On the other hand, the distinctive shapes and colors can function as a decorative element. Several of the boards available are hand-washable (minus the power source). Read the documentation carefully. In place of pins, these boards have metal eyelets which you can loop conductive thread through to sew soft circuit connections. Some boards also have snaps — or eyelets large enough to solder on snaps — for easy removal. Sensors gather information about the environment, the user, or both. Examples of the former include light, temperature, motion (ACC), and location (GPS). Examples of the latter include heart rate (ECG), brain waves (EEG), and muscle tension (EMG). 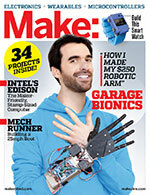 A few wearable microcontrollers have basic sensors onboard. Other manufacturers offer a range of external sensor modules that connect to the main board. When scoping out a wearable design one of the first things to consider is the power requirement. Do you just want to illuminate a few LEDs, or do you want to run a servomotor? Boards with an integrated holder for a lithium coin battery are nice for low-power projects that need to be self-contained. However boards with a standard JST connector (with or without a circuit to charge LiPo batteries) are more versatile. One generic way to describe a wearable system is: In response to X, where X is the input from a sensor, Y happens. Actuators such as LEDs, buzzers or speakers, and servomotors are what make things happen. If you’re still craving information, there is so much more information available in the book Wearable Electronics by Kate Hartman, available in the Maker Shed. 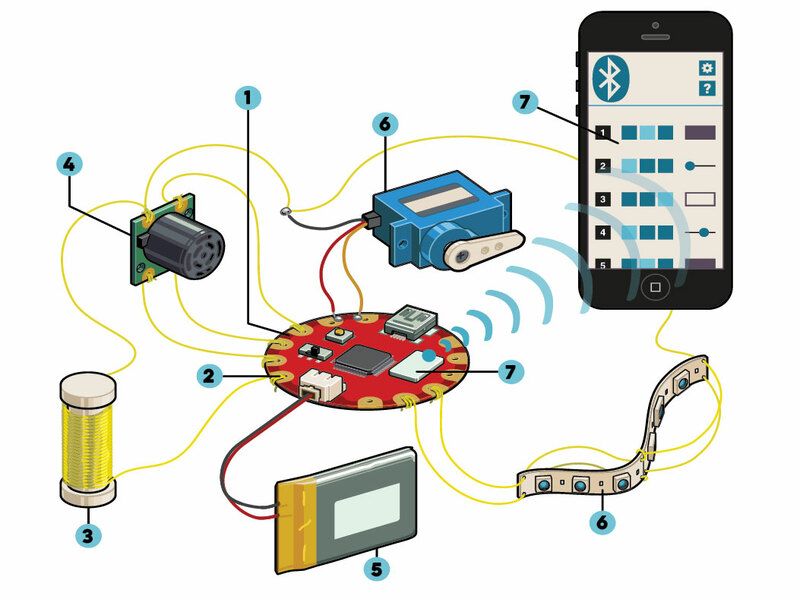 Now that you’ve got the basics, you should jump right in and start making some wearables! There’s really no better way to learn. Some of our favorites are The bag that can charge your electronics, awesome light up shoes, light up hoodie, and these glowy cyber punk spikes.